After over a year at SaveABunny Humphrey finally found his forever home with a wonderful human and her bunny, Silver. Humphrey's happily ever ended suddenly when he succumbed to pneumonia from a very virulent strain of pasturella. All of us loved Humphrey and we grieve his loss. I just found my forever home and a bunny girlfriend! My name is Humphrey. I am a fun, active and adorable, neutered Dutch/dwarf mix boy who is eager to find a loving home. I am lonely and crave attention and a home of my own to run and do bunny binkys and dances for you. My fur is a thick, charcoal gray with striking white contrasts. I also have little white socks to match my cute white nose. I'm a good choice for someone who likes an energetic and busy bunny. I love to have projects to do, such as redecorating with cardboard I shred to my own very high specifications! 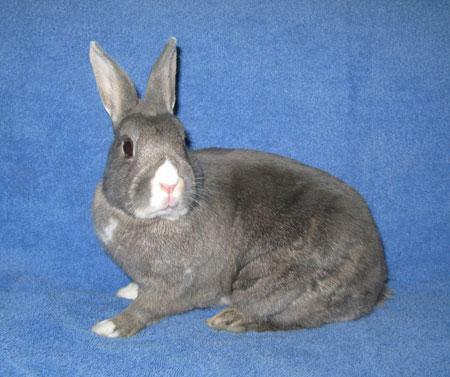 If you want fun and adventure, not a "lazy" or "loafy" rabbit man around the house, then pick me!